stabilize the underlying shoreline with Geotec Tube. Home Owners and HOA's love us because we never destroy the existing turf or landscape. Our process removes the silt build up and re-establishes a clearly defined shoreline while reclaiming lost waterfront property that will benefit your property values and beautify your landscape. Erosion Control with Geotec Tube and superior technique reinforces our polypropylene geotextile that has been engineered specifically for shoreline erosion control. Our geotextile technology offers an affordable solution for dealing with shoreline restoration, erosion control, land stabilization and environmental preservation. Working on the basic principle of containment, dewatering and consolidation, the Geotec Tube stabilizes the underlying shoreline and creates a barrier against further erosion. Our eco-friendly geotextile tube technology restores your shoreline to its original condition while increasing soil stability, promoting drainage, and providing long lasting erosion control. Our erosion restoration techniques involve recycling sand and organic material from the adjacent body of water. This removes the need to bring in costly material and the potential of damage caused by heavy equipment. Once the shoreline has been completely restored any type of foliage can be planted and it can be safely walked on or driven on by machinery. Erosion restoration will design and create the perfect landscape that you desire! Every year, erosion causes millions of dollars worth of damage to the shorelines of public and private properties. Without adequate protection, this degrading land can cause very significant and costly damage. So please browse our site and learn about how Erosion Restoration can restore your properties natural charm and prevent further erosion. HOA's, golf course superintendents, lake managers, and government agencies that are eager to improve their lakes and shorelines while controlling expenses have found the Geotec Tube to be the perfect solution. With current budgets being tighter than ever, the Geotec Tube has proved to be the most cost effective method of erosion renovations while providing the greatest natural aesthetics. Our shoreline restoration technique involves recycling sand and organic material from the adjacent body of water. This removes the need to bring in costly material and the potential of damage caused by heavy equipment. Once the shoreline erosion has been completely restored any type of foliage can be planted and it can be safely walked on or driven on by machinery. Our Erosion restoration team will design and create the perfect landscape that you desire! Our shoreline erosion repair & control experts can help! Every year, erosion causes millions of dollars worth of damage to the shorelines of public and private properties. Without adequate protection, this degrading land can cause very significant and costly damage. So please browse our site and learn about how Erosion Restoration service can restore your properties natural charm and prevent further erosion. It’s important to understand what erosion restoration is, but it may be even more critical to find out ways to prevent it. Of course there are certain things mother nature will bring that are inevitable but we must do what we can to prevent devastation and destruction. In this case, prevent our shorelines from erosion and losing land. 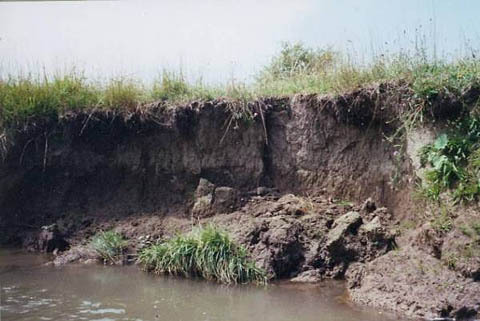 When erosion first starts to occur, the land loss is minimal in most cases and there is no sudden emergency for stopping it. However, it will inevitably worsen through time and eventually what was once only 6” of lost land, turns into 6’! Without Erosion Control properties that have such severe erosion that their home could potentially sink down. 1. Control soil erosion by planting vegetation, trees, ground cover, shrubs and other plants. Roots from these plants will help hold soil in place on the ground. Soil will not blow away due to wind, or be washed away from rain as easily. 2. Create windbreaks, which are barrier rows planted along the windward exposure of a plot of land. Windbreaks made out of trees, such as evergreen trees or bushes help prevent erosion by preventing wind from blowing across your land. 3. Grow cover crops on farm land. When land is not being used during the off season, cover crops can help prevent soil erosion due to wind and rain. Legumes (beans) are often used as cover crops. 4. Apply mulch to retain moisture and also help prevent soil erosion. Topsoil is not as likely to be washed or blown away when it is covered by mulch. Mulch is often used in flower beds. 5. Construct surface runoff barriers, such as edging made of bricks or stones, can help prevent soil erosion by minimizing runoff. If runoff is minimized, soil is less likely to be carried away by groundwater runoff. 6. Use contour farming when farming on sloped areas. This conservation technique is to follow the actual topography of a slope when planting crops. Using the natural lay of the land in this way can also prevent soil erosion. 7. Try terrace farming and gardening to decrease groundwater runoff. Create nearly level layers of crops on a hillside.